On October 31, 2004, CPO lost a true friend and one of our founding Board members, Art Herkenhoff. Art was a hero in all the areas that truly matter: in Faith, family and pro-life involvement. Art had enormous courage in the face of opposition to proclaim the Truth of Jesus Christ and the Catholic Church, and he always exhibited true charity, humility and joy. Each year CPO receives many outstanding nominations for the Arthur A. Herkenhoff Award. The Board of Directors chose to present the 2016 Arthur A. Herkenhoff Award to a remarkable woman, Mrs. Jeanette Meyer. Jeanette is the Executive Director at the Apple Valley Pregnancy Choices LifeCare Center. In 2012 she began a pilot program for implementing Life Coaching. Since then five other centers have followed suit who are affiliated with TLC Options for Women (Abria, Minnetonka, Red Wing, Hastings, and Life-Care Center East on White Bear Ave) and the list is growing. Another independent center in St. Cloud is having their staff enter the life coaching training program. Life Coaching is a unique approach to building trust and engaging people at a deeper level to open their hearts to what truly matters. Jeanette helped implement the Grief to Grace: Healing the Wounds of Abuse Retreat in Minnesota, a 5-day spiritual retreat for anyone who has suffered degradation through physical, emotional or sexual abuse. She is also a member of the Facilitating Team on the Rachel’s Vineyards retreats. Jeanette enjoyed being a cantor for 15 years, before her current job. Her husband, Marty, was recently ordained a permanent deacon which calls on her time and resources in new and different ways. Jeanette has been married to her husband, Deacon Marty Meyer, for 40 years. They have 5 children and 8 grandchildren. She is a member of Mary, Mother of the Church in Burnsville. Jeanette loves her Catholic faith. She has a strong prayer life and attends daily Mass whenever possible. 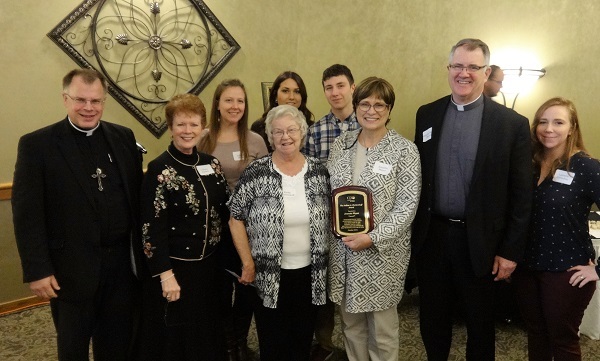 Jeanette Meyer received the 12th Arthur A. Herkenhoff Award at the CPO annual Luncheon & Fundraiser held at the Southview Country Club in St. Paul on October 29, 2016. The CPO Board of Directors seeks the names of individuals who would be worthy of nomination for the 2017 13th Annual Arthur A. Herkenhoff Award. The persons nominated should exhibit the same qualities, principles and values which characterized the life and person of Art Herkenhoff: Faith, family, pro-life involvement, courage, charity and joy. Please submit your nomination by October 1, 2017. You may complete the Online Nomination Form at: https://www.catholicparents.org/official-candidate-nomination-form/ or contact us at 651-705-5409 and we’ll be happy to mail you the form.